I hope this finds you doing well as you climb Mount Wednesday and start the downhill journey into the weekend! Be careful you don't get going so fast that you miss the awesomeness Thursday and Friday have in store for you! I mean, how cute is that dog?! Our dear and long-time local friends said goodbye to their beloved Basset Hound "Bodie" recently and I made this sweet card for them. The basset stamp is from a great group of dog stamps by Katzelkraft. The sediment is by PTI. The background was lightly painted with my Ziggies. It's time for another Rudolph Days Challenge and this is my entry. 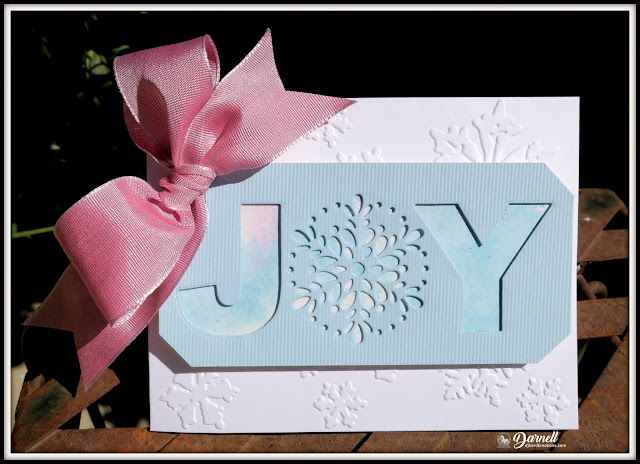 The pretty snowflake-JOY die is NBUS from Poppystamps, cut from an old scrap of blue textured pp. I lined the tag from behind with a snippet of smooched ink. Then I attached a pretty pink bow to pick up the pink in the background. I attached all that to a snowflake-embossed card base. This one will go in the "Hand-Deliver" stash box. ABC Christmas Challenge: "S is for Snow." Jingle Belles: Let It Snow. Pixie's Snippets Playground: A/G, but use those snippets! Didn't I do a marvelous job applying my little round foam glue dots to make sure my tag would adhere to the card base and not be uneven? Phew! That took a while! When I was finished, I proudly held it up for Hammy to see. In that droll way of his, he smirked and asked, "And on your finished card, will the recipient know what YOJ means? In fact, what does YOJ mean?" I whipped my head around and said, "Wha - !" Fortunately, with a little patience and a mug of wodka, I was able to unstick all of the dots and restick them on the reverse. Never a dull moment when you craft while old and distracted! I was delighted last Thursday to welcome a visitor to the Playhouse who came from very far away! This is my friend Sonja all the way from Slovenia! Her blog is Old Punca and we have been online friends since September 2014, when we first commented on each other's blog! It was a pleasure to meet her and her husband Silvo in real life and enjoy lunch and a few hours getting to know each other better! Thank you, Sonja, for making a visit to see Hammy and the Playhouse a part of your San Francisco holiday!! As always, thank you for coming by to visit the Playhouse and special thanks to you if you take the time to join as a follower! Please let me know you came by so I can be sure and return the flavor, although I'm not sure when that will be right now! I'm taking off on Thursday on an extended vacation to visit my sisters and friends, leaving the Mister here to keep the home fires burning. I've got my October Twofers scheduled so my blog won't be completely dark and I just might pop in now and then to surprise you! The card for your friends is perfect. See, I get home form my trip, all ready to get chatty and start joining in stuff again and you go flouncing off with nary a backward glance! Those pet sympathy cards are important and how lucky you were able to personalize it. Your joy card is fabulous. THat is a wonderful die. I love the bit of pink blush brought out by that gorgeous bow. So good you had the vodka nearby...lol. Have safe travels and a good visit. How wonderful to meet an online friend. Hugs. Cute cards Darnell!! Can't tell you how many times I have made the same mistakes! Hahahahaha!! Oh Darnell, thank goodness for Hammy, he really gets his owner out of some sticky situations for sure. Been there, done that my dear, unfortunately, I don't have a Hammy to point out my boo-boos. Anywho, love both cards, your friends who lost their beloved doggie, will treasure this beautiful card, I have that set and all of these images are versatile as well as adorable. That basset card is so sweet. I'm sure your friends appreciated your thoughtfulness. The joy card is beautiful and I'm sure the yoj would have been too. Might have been a fun time to give it to someone and see their reaction. Glad I'm not the only one who has done something like that. ;) How wonderful for you and your new friend to be able to meet in person. The www is truly far reaching!Safe travels and have a wonderful time on your trip. Hugs! Sorry to hear about your friend's dog. What a nice card you made for them. The 2nd card is joyful indeed. Love that snowflake in the middle. Still laughing at your YOJ incident - absolutely something I've done in the past. But once corrected, you ended up with a lovely card! And the first card tugged at my heartstrings as it's still so recent that my dear old Will died so I know how sad your friends must be. Such a cute basset on their card - I'm sure it brought them some comfort. It is so hard to lose a family pet and I know they will appreciate that you took the time to acknowledge their loss with that sweet card. Boy Hammy sure took the joy out of the card for a minute, didn't he? All those perfectly placed dots - we've all been there! How wonderful to meet a friend from Slovenia in person. I love that. Gorgeous cards. I'm sure the first will bring comfort. As for the foam pad blooper, we've all done it! YOJ brilliant, so pleased you had a mug of vodka to sort it out LOL! Your finished card is however so pretty - I too have a hand deliver box! The sympathy card is so sweet and I am sure will be appreciated, that dog is just so lovely. I love that pup and think your sympathy card (always hard for me) is perfect for the loss of a sweet family member. Going from the sublime to the ridiculous, I'm still giggling over your careful placement of adhesive...now let's see who does that remind me of, hmmmm? Anyway the card and that perfectly tied bow is very pretty. Lovely that you got to meet Sonja, all the way from the other side of the world, WOW! Your sympathy card couldn't be a more perfect match for Bodie, Dolly! and your YOJ, I mean JOY card is beautiful with the big pink bow! I try to make cards flat but bulky is so much more fun! Glad you got all the dimensionals off the front side. Sometimes that doesn't work too well. Ask me how I know! Your sympathy card is so cute, I am sorry for their loss! Your Christmas JOY card is pretty. Applying those foam pieces can take time! Darling stamp of the Bassett Hound and your snowflake tag is very sweet--and flat and even!! Have a great time with your sisters!! Hello, Darnell! I'm having a nice visit here today at long last. Seems like it's been forever! I'm so ready to plant my feet in one spot for a while. Your sympathy card is very thoughtful and sweet. I know Brodie's people were as saddened by his loss as for any family member, and your card probably made them smile with happy memories. You made ME smile with your pretty Joy card! The things we do when stamping, sheesh! I'm glad you were able to salvage it. Such a sweet doggie sympathy card for your friend and pretty and filled with Joy Christmas card, Dolly. That is a LOT of dots to adhere and NOT figure out you were on the wrong side until ALL done, but heh, just think how much easier and more careful you will be the next time...maybe..lol!! Wonderful photo of you and Sonja too...She gets the prize for the farthest away visitor to your play house..right?!? What a special few hours. TFS Hugs..
Love both of your cards. That is a cute basset hound and I love the joy tag with that pretty pink bow. When I saw the photo I had to wonder if you put the foam dots on the wrong side. I got a chuckle reading your comment. So nice to get to meet blogging friends in person. Your Rudolph card is great! I loved the idea of the misty sky behind the YOJ, or wait, I meant behind the JOY! I have done that so many times too. Thank goodness pop dots are a bit less tacky than double sided tape, so they usually release OK! I stress on usually...ahahaha! Wonderful cards! How fun to have a visitor! 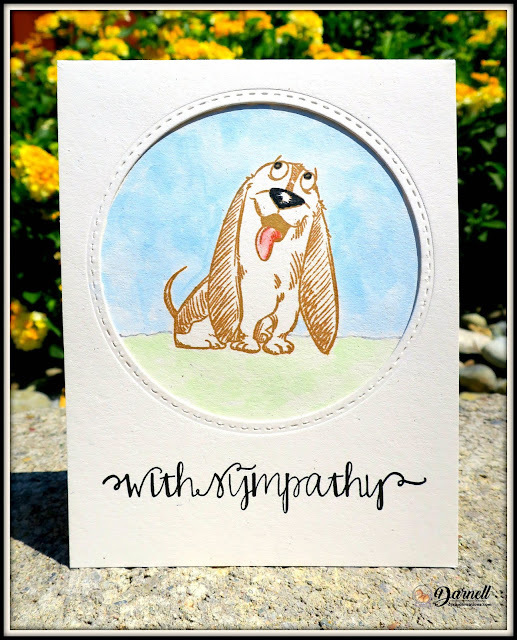 That really is a wonderful pet sympathy card, and unlike the sadness most contain, this brings a smile into a sad occasion. Adorable! And so is the Joy card - OMG I cannot stop laughing at you putting the foam dots on the wrong side! Been there/done that so welcome to my world! My specialty is putting card fronts on the card base upside down! LOL How wonderful to meet your friend from Slovenia, that's just awesome! You made my day when I saw your first card as I recently made a pet sympathy card and the dog was smiling with his tongue out but that was the way I meant for the pet mom and dad to remember their beloved pet As for the JOY - love this style - I have done this once but need to do it more. Love both of your cards. Such a cute dogie card but sorry for the very sad occasion x. Your Joy card is fabulous and so very beautiful and what a great save. Hammy is so helpful x Great photo of you and Sonja and glad you had such a lovely time x. Enjoy your time away with friends and Sisters, have fun and make memories x.
Pets are much more than just animals, so your friends will really appreciate your lovely, thoughtful sympathy card. Great doggie image and love the design. Lovely EF and a great joy die. Glad there is someone as daft as me, I could easily have done that. Great cards! I LOVE that joy die...awesome holiday card Darnell! Hope you are having a great day! Two fabulous cards Darnell! I know your friend is going to appreciate your kind words on losing their four legged baby. And how cool that you got to meet a fellow crafty friend from half way around the world!!! Love that die cut, especially on the textured cardstock ... oh so pretty ... so very glad you shared your SNOW with us at Jingle Belles. Your Basset Hound card is darling. I'm so sorry for the loss of your friend's pet, that's never easy. Oh goodness to the dots escapades! It was worth your effort, it look terrific and your bow is simply marvelous! Have a wonderful visit with your sisters, safe travels! You are lucky to have Hammy. Otherwise we all would be confused about YOJ. 😀 I like both of your cards. A dog is coloured perfectly. Such a lovely card for your local friends on the loss of their dog. Love the "Joy" card - thanks for sharing your 'oops' we are all human. What a special afternoon with your most recent guest to the playhouse. It is always such fun to visit your blog Darnell! Inspired by your sweet cards and your ability to laugh at your mistakes! Congratulations on getting to visit with Sonja!! It is always amazing to me how small the world has gotten thanks to blogland! Darnell, your post made me sad in the first moment (cause of the reason for the dog card) but your funny description of the YOJ layer made my day! Wish you a smooth journey and can't wait for the next twofer-challenge! Well, I would NEVER put glue dots on the front of an image (she says with a sly grin on her face, 'cuz she knows she's lying). Your card turned out perfectly, even with that rough start. he he. Your sympathy card is perfect, too. We all want to remember our beloved pets as the happy family members they were. So sorry about your friend's dog... I'm sure that lovely card will be much appreciated. Great Christmas card and I did laugh about your dots on the wrong side... Glad you were able to remove them! Lovely photo! What a joy to have visited the playhouse! Beautiful creations, I am sure the first card will bring a lot of comfort to your friend. I did find your story about the tag rather amusing, something we have all done from time to time! Oh Darnell ..... we've all done it. Put stuff on the wrong side that is. Great save though. Love the little pooch too. Two fantastic cards, how cute is that dog!, love how you made your tag card. Lots of good things happening here.. Sweet of you to make a personal card for your friend who lost her dog. I know she will appreciate seeing this. And the second is so pretty! I love that you got to meet another crafty friend. Jealous that she got to visit the playhouse.. but I'm not giving up yet! Two fabulous cards, Darnell. I know your friends will appreciate and love the card you sent for the loss of their dog. And that Joy card is so pretty. Have a great weekend and always so fun meeting Crafty friends. Hugs to you. I thought you were spoofing at first when I saw the foam dots. Removing my foam would have torn the die to bits and pieces - pun intended. ;) I'm glad you salvaged it. This whole post is about NBUS dies and stamps. The playhouse must be getting full. I love how you carried the snowflake from a die cut on the tag to the embossed snowflake background and the pink bow is beautiful!! Thank you so much for playing along with the Rudolph Days Challenge! Aww what a great way to remember Bodie in a cute stamp. We said goodbye to Peter the rabbit this week, our next door neighbour's pet. He was buried in the back garden. Our curious 4 year old was desperate to see him in his box, but we advised against! And card making wouldn't be much fun if we didn't do things the wrong way round now and again! Hello Darnelll! This is a lovely sympathy card for your friend. The JOY card is so beautiful and the litlle mistake is just one in a million that all crafter's make ;). Sonja told me, that she will visit you and your play house. I'm glad that you like my lace brooch and thank you to stop by at me and leave a lovely comment. I love both cards Darnell. You reminded me of the down side of having a dog if the time comes for them to go to the Rainbow Bridge. LOVE your Christmas card and did giggle at the sticky pads being on the wrong side, just the sort of thing I'd do! Enjoy your break with your sisters! What lovely cards!! That dog sympathy is so cute. I love his little face!! I cannot believe you actually took the time to take all those dots off like you did!! Kudos to you!! I would have just thrown it away and called it a day. Love the large, pink ribbon with the blue. So fun that you had company from so far away too!! Oh what a sweet pet sympathy card! And you made is so very personal for your friend's loss. Your JOY card is beautiful ~ love the gorgeous pink bow! So, who out there in CraftLand hasn't made that very same booboo! Way behind, but finally getting to your blog. Such a sweet card for your neighbors--perfect way to say you care! So, you're coming my way in December to hand deliver that card?!--hurrah! It's absolutely gorgeous & I'll have to add that die to my wishlist!